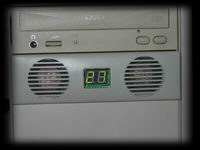 Speeze is a well known manufacturer of “thermal and silent computer solutions” that has been in business since 1991. 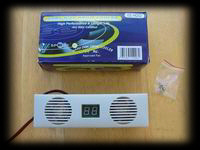 In addition to their processor cooling products, they offer a few system cooling components, such as the EE-HD02 Hard Drive Cooler. The Speeze EE-HD02 is sold as providing “High Performance and Longer life” for your Hard Drive. 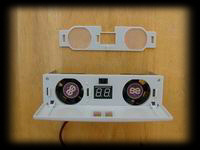 I have always believed that keeping any electrical/mechanical device cooler will increase its life. I’m not sure that cooling a hard drive will increase performance though. 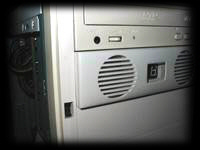 Remove the front cover from the computer and install the 3.5” HDD in the bracket with the screws provided on both sides of HDD. No bracket is needed for 5.25” HDD. Secure the HDD in the bracket with the screws provided. Insert the HDD with bracket secured to the HDD bay. Snap the HDD cooler at the front of the HDD installed as above. Make sure the HDD cooler is secured with the 4 pcs. Screws as provided. 412 pcs. Screws for securing the HDD and bracket. 44 pcs. Screws for the HDD cooler. The picture below details the contents of the box, as I received it. From the instructions and “box contents” listed above I was under the impression that there would be some sort of additional brackets included for mounting a 3.5” hard drive, but this wasn’t the case. 4Air Flow: 2 x 10.0 CFM at 4,500 RPM. 4Life Hours Ball: 50.000 hrs. 4Application: Any free 5.25 in the PC case. 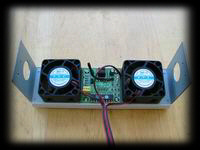 The fans on this device are heavy-duty 5 blade units that throw out quite a bit of air, very silently. I couldn’t hear the fans over the power supply. The removable micromesh screen on the front is a very nice touch, that is held on by a couple of tabs and slides to the left to release. 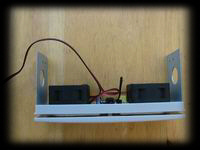 In the below right image, the black wire in the shape of an “L” between the two fans is the thermal probe. I dug through the parts graveyard and came up with a couple of 3.5” to 5.25” HDD mounting brackets and mounted them to my hard drive. 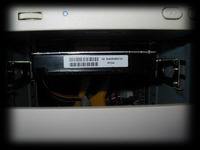 I then opened up a bay and inserted the HDD (below left image). Taking a look at the mounts for the cooler (above right image), it looked like I could slip the tabs for the cooler on the outside of the brackets and the inside of the bay. This was much easier said than done. It took a bit of wrestling, but it was all mounted up and ready to go. Last step is to hook the device to 1 spare 4 pin Molex connector to power the fans and the display circuit. The Speeze cooler has a bit of a flange on the outside edges; this flange or lip will not let the cooler go in the bay any deeper than pictured. Better allow for a good ¼” or so from the front face of your case. The bay cover that came with my case would not clear the cooler. My cover has an opening for the top most bay, but the opening will not clear the Speeze either. Make sure you have room for this device. The temperature sensor sits about 1 inch from the circuit board and the display reads this temperature in degrees Celsius. The display is a nice green color and not too dim or too bright. The flash in the picture below doesn’t do the display justice. The background around the display is not normally visible. With the positioning of the temperature sensor, the readout is probably going to indicate room air, maybe a bit warmer due to case temperatures. This, although not a true hard disk temperature, should give a good indication of the air flowing by the drive. When I powered on the system it showed 27 degrees, I ran HDTach over and over again and only saw a 1-degree change ever. The greater amount of air flowing into the case did however lower my case, motherboard, and processor temps a few degrees. This cooler, although questionable when it comes to being only a hard drive cooler, does make a very nice, filtered, dual intake fan. This is how I plan on using it. I will put the hard drive back into the normal position and run the Speeze cooler as a very powerful, easy to clean, intake air system and internal case temperature monitor. On the plus side, the EE-HD02 Hard Drive Cooler carries a suggested retail price in the teens (US dollars), and look for it to cost even less when it hits the shelves of Speeze’s main U.S. outlets, Newegg and Tiger Direct. Special thanks to Speeze for providing the EE-HD02 to Bigbruin.Com for review!